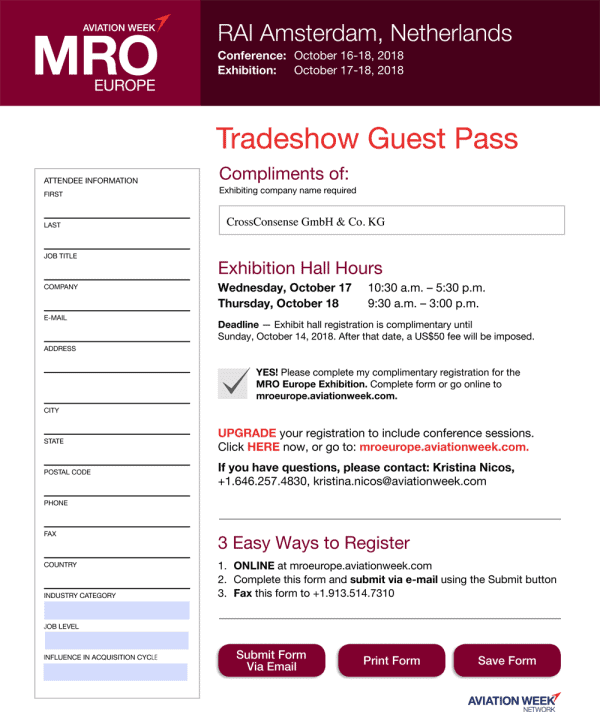 Download the Tradeshow Guest Pass form, fill it with the appropriate information and follow the instructions given on the form. Take the opportunity to meet the CrossConsense team at the MRO Europe taking place in Amsterdam on 17-18 October 2018. On this event our experts on-site will be glad to demonstrate the newest version of CROSSMOS® – our electronic technical logbook with a fully functional bi-directional interface to AMOS which is live on SWISS and Edelweiss and to be introduced at further airlines like Aegean, AeroLogic, Air Dolomiti, Alitalia, Lufthansa and Lufthansa CityLine. And, of course, you are also invited to get an insight into our other products, i.e. ACSIS and Aircraft Fleet View and our services around AMOS Support.